Whole-home audio has become popular recently thanks to products like Sonos making it easy. In the old days speaker wires had to be fished through walls, but those days of cables and intense labor are gone. Now it can be done via a wireless means and almost everyone has a home network -- something else that was once the domain of geeks and experts. Now one of the top-tier makers of home audio equipment is getting in on the act as Harman Kardon announces its newest offering at the Consumer Electronics Show taking place this week in Las Vegas. The new OMNI+ is promising true HD audio broadcast around your home wirelessly. 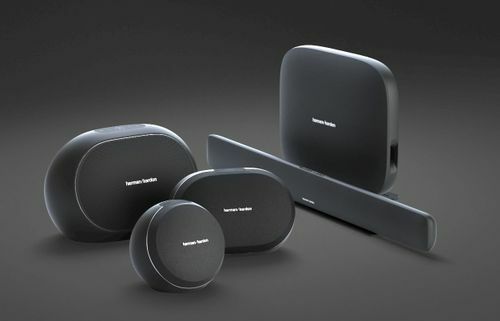 "The Harman Kardon Omni+ line is unique in its true HD sound quality, versatility and functionality", says Michael Mauser, president of Lifestyle Division at Harman "Customers want to stream from many different sources, control their speakers from their phone or tablet and have one system to meet all of their needs. Whether they want one speaker or five, this Harman Kardon home audio system provides the best in wireless HD sound quality and access to all the content they care about". This brings a wealth of flexibility as far as streaming services go. It can stream media stored locally, but it also offers Pandora, Deezer, Spotify, TuneIn Radio and more. There's also an array of speaker styles to choose from, including the Omni 10+, Omni 20+, Omni Bar+, Adapt+, and the Omni 50+, which has IPX5 splashproof and outdoor capabilities. Customers start with a small package and can add more speakers later as they see fit. It also allows for streaming both the same music everywhere or different tunes for different rooms. It can even be configured into a 2.1 or 5.1 surround system. It has support for 802.11ac 2.4GHz and 5GHz networks. All products will be available this summer and prices range from $199 to $999 depending on which models you want.